So I had such great success with painting my glass cake stand like mercury glass I decided to try to create a milk glass look. 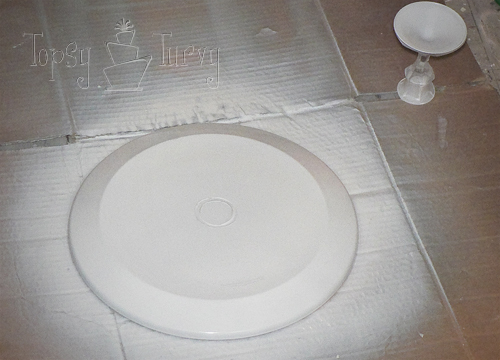 I just spray painted the outside with a high gloss white before I put the cake stand together. You’ll want to paint the outside because 1) you want the cake stand to be food safe, so you don’t want the inside painted. And 2) you get a more authentic milk glass look when the white is showing from the far side of the glass and not directly on the glass itself. I think it turned out great! And now I have another great cake stand to show off my goodies!!! 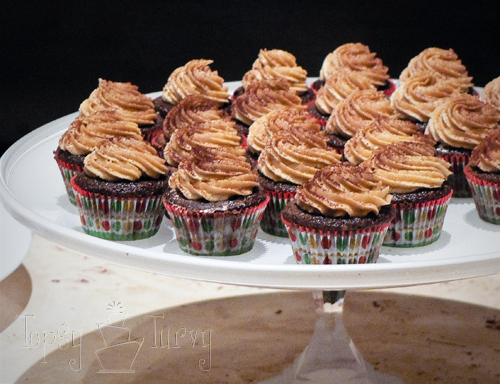 Like these chocolate peanut butter mini cupcakes. It’s beautiful Ashlee! And those cupcakes look heavenly! Thanks! I totally forgot to take pictures while making them… I was in a huge hurry, they were a hit so I think I’ll have to make them again to share!